Saint Patrick’s Cathedral, one of Ireland’s leading visitor experiences welcomes almost half a million tourists and schoolchildren annually. 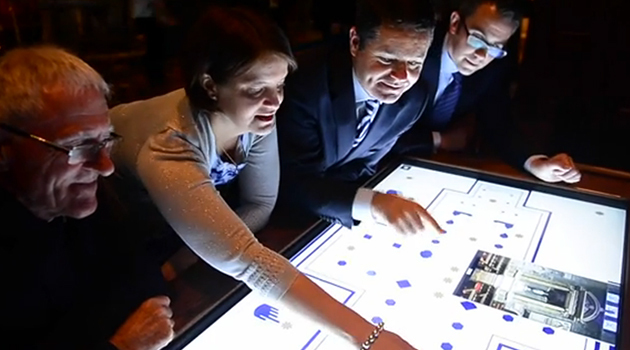 We have been working with Saint Patrick’s on it’s identity and communications and were delighted to have played a role in its first real move into technology. This week the Cathedral launched it’s new ‘Discovery Space’ in the south transept which is designed to bring a more interactive and immersive experience to the 800 year old building and its history. 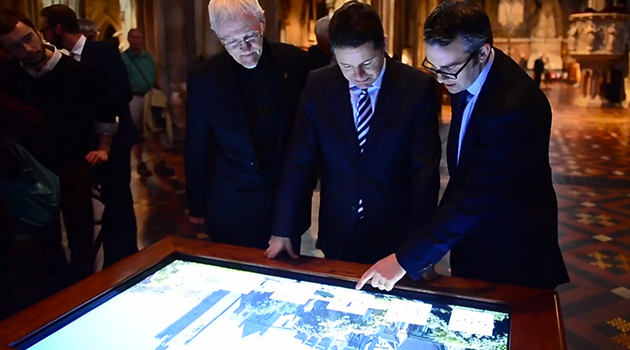 We worked closely with the internal team to translate core elements from the new identity system across a large touchscreen table and other digital devices which offer photography, audio and information on the cathedral’s layout, history and heritage. We developed communications for the wonderful new Discovery Boxes that launched on the day which are specifically designed to engage young visitors. The Discovery Boxes are built using recycled wood from the cathedral’s disused pews and contain games encouraging children to Build A Cathedral and Try Brass Rubbings. Few can claim to work with an 800 year old cathedral and we’re looking forward to sharing the new brand identity and communications in coming weeks.